Beautiful map of Siem Reap and the entire Angkor complex of temples presented as a 3-D panorama drawing, with every temple and building drawn with full architectural details. The map offers a bird’s-eye view of the whole area from the Western Baray Lake to Wat Bakong, Lolei and Phnum Bok. 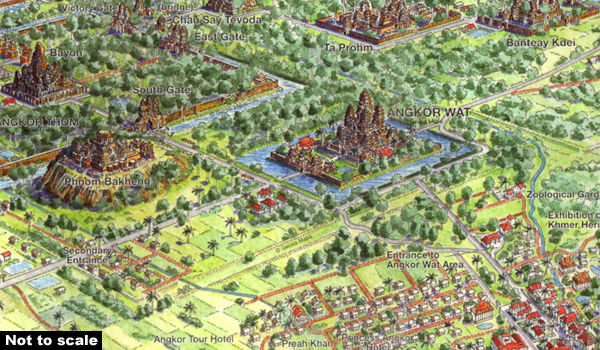 The main map, centred on Siem Reap, with the Phnom Krom in the foreground and looking north toward the Angkor temples, shows all the roads and tracks in the area and can be used for exploring its famous monuments. An enlargement shows Siem Reap, indicating various hotels and public buildings. Twelve more panels surrounding the main map provide more detailed drawings of various temples and monuments, including Angkor Wat, Angkor Thom with a separate excellent drawing of Bayon, Phnom Bakheng, Ta Prohm, Banteay Kdei, etc. Drawn by Ruben Atayan, the creator of several maps listed on our website under the Terra Nostra imprint, the map provides both an excellent introduction to this wonderful area and a splendid souvenir of an interesting holiday.